Catalysts are arguably the oldest among all nanotechnology products used in industry. Producing the huge amount and variety of materials, commodities, and vital products of our daily life without them is unimaginable. No wonder, catalysts are also a key to sustainable energy and saving resources in future economies. While from the outside often only their huge reactor housings or, as in the case of the well-known automotive catalysts, a solid box is visible, it is the catalyst structure on the nanoscale which determines the chemical reactions at its surface. 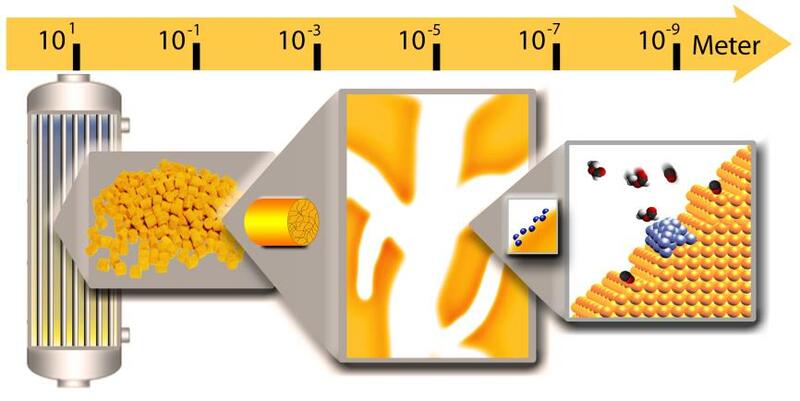 Our workgroup’s research activities revolve around innovative nanostructured materials and their potential for applications as heterogeneous catalysts. While performing catalytic tests or developing new materials or applications, we always try to develop an understanding of the materials and their interaction with molecules from the gas phase on the molecular level. For that purpose we often combine experiments on catalysts at typical reaction conditions with studies on carefully chosen, well-defined model surfaces, either experimental in ultrahigh vacuum or by calculations within density function theory.